You can’t just allege grounds for divorce in your petition and expect the court to grant your divorce accordingly. If you file for divorce on fault grounds, one of two things must happen. Either your spouse will not contest the grounds, essentially admitting to the wrongdoing, or you must prove your grounds at trial. Some states, such as New York, have even required proof of no-fault grounds at trial when one spouse objected to the divorce. One of the most common reasons for a divorce case to proceed to trial is a couple’s inability to agree on property distribution. If your state recognizes the concept of separate property -- and most do -- the judge will first set aside premarital assets as well as inheritances or gifts made to one spouse. These aren’t available for distribution in divorce. He will then determine the value of marital property and decide how to apportion these assets between spouses. Determining value usually involves the testimony of expert witnesses, such as real estate appraisers or pension evaluators. Custody is another hotly contested divorce issue that often progresses to trial. In some states, judges appoint guardians ad litem -- attorneys who represent the best interests of the children in a dispute. Some state courts will order custody evaluations as well. A court-appointed professional will assess the dynamics of the family and make a recommendation regarding custody. In divorce trials, you can also present your own witnesses and evidence to substantiate why you think your spouse would not be a suitable custodial parent. Judges do not normally litigate child support in divorce trials. The federal government mandates that every state must have a system in place for calculating child support and the amount of support is determined by that method. You can’t really argue the amount at trial because it's set by a statutory formula. However, few states have formulas for calculating alimony, so the amount ordered by a judge is open to some debate. Other alimony issues that might be heard at trial are how long one spouse should continue paying the other and whether or not the award is modifiable if circumstances change. 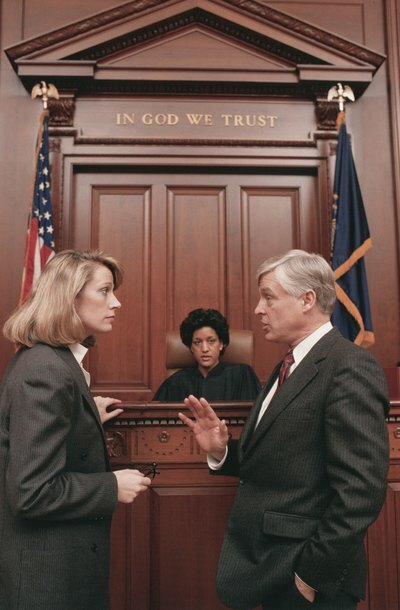 What Is a Conciliation Hearing for Divorce in Michigan? The Michigan divorce process is relatively unique in that the state uses the services of a Friend of the Court. The FOC is part of the family court division in each Michigan county. Its purpose is to relieve the court system -- and the state’s judges -- of some of the detail work involved in divorce cases. It oversees child support enforcement and helps to implement child custody orders early in the divorce process. Most states prefer that spouses negotiate a marital settlement agreement on their own when they divorce, rather than ask the court to decide issues at trial. These agreements must usually be submitted to a judge for approval before they are incorporated into decrees or judgments. A judge won't approve your agreement if it's unconscionable. If you don't file for divorce, but just remain separated under your agreement's terms, it may not be enforceable either.